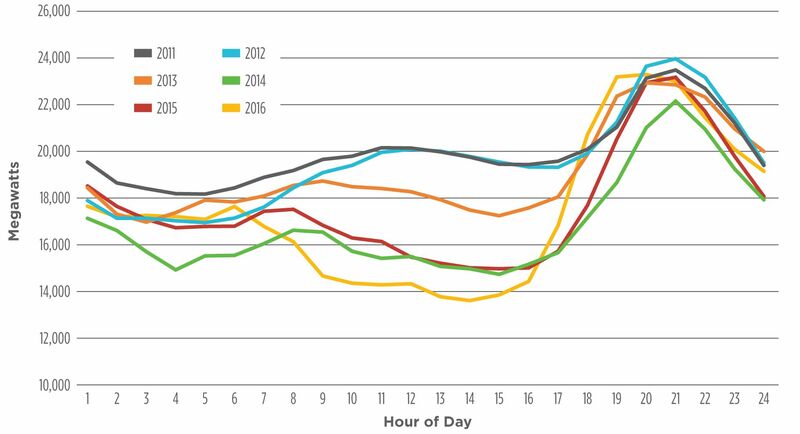 As the duck curve worsens in California, the state needs to get serious about demand-side management and grid flexibility. Renewable portfolio standards are on the books in 37 states, Washington, D.C., and four American territories. Together, these requirements cover 55 percent of all U.S. retail electricity supply, and have driven 60 percent of all growth in renewable electricity generation. Going forward, meeting these standards will require the addition of 60 more gigawatts of renewable energy capacity by 2030. 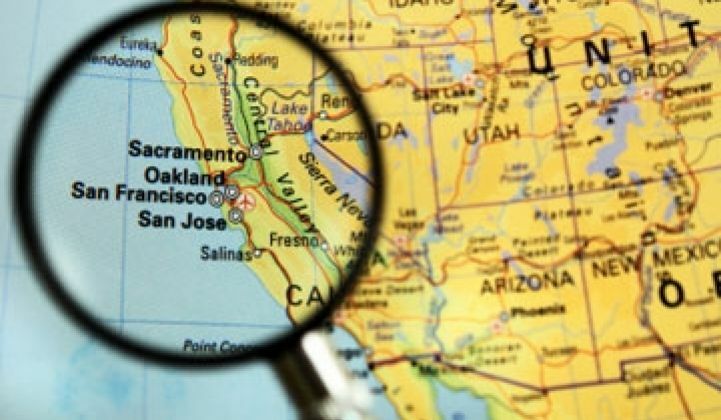 Aggressive states such as New York and California that are targeting 50 percent renewable generation by 2030 are entering uncharted waters as they integrate new intermittent sources of clean energy at scale. California, which currently houses almost half of all installed solar capacity in the country, is already experiencing grid challenges at a rate faster than expected. Just a few years ago, some analysts were warning of the transformation of California’s load shape into a “duck curve” due to this growth of utility-scale solar capacity and distributed generation. Today we are exceeding their projections -- the duck curve has arrived with a vengeance. ● More short, steep ramps which require the ISO to bring on or shut down generation resources to meet an increasing or decreasing electricity demand quickly. ● More frequent periods of oversupply (times when more electricity is supplied than is needed to satisfy real-time electricity requirements). ● Decreased frequency response, as fewer flexible generation resources are operating and available to automatically adjust electricity production to maintain grid reliability. Storage is often heralded as the grid savior, and it will undoubtedly play a crucial role. But in reality, meeting the renewables load challenge is going to take an aggressive, all-hands approach that includes a range of distributed energy resources and strategies such as more flexible generation, exporting excess solar power, demand response and shiftable load, and optimized electric-vehicle charging, in order to balance the influx of variable solar energy that will continue to come on-line. 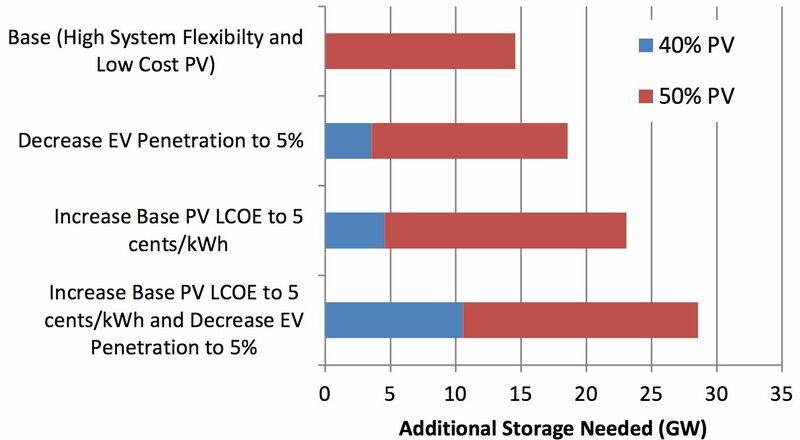 The recently published NREL report, Energy Storage Requirements for Achieving 50% Solar Photovoltaic Energy Penetration in California, models likely scenarios for storage deployment, and finds that even in an aggressive scenario that maximizes grid flexibility with storage and other available DERs, we still come up far short of what’s needed. That means that even with flexible generation, transmission, demand response, and electrification of 25 percent of the vehicle fleet in California with largely optimized charging, we will still need nearly four times as much storage as is projected -- and at an untold cost. To illustrate this gap, a recent GTM Research study estimated that by 2020, there will be approximately 4.5 gigawatts of storage on-line across all sectors nationwide. The only way for California and other states to achieve the high renewable penetration rates required by their RPS goals, while maintaining a stable and affordable grid, is for that grid to become dramatically more flexible. A recent report by the Lawrence Berkeley National Lab discusses how load can be altered to have additional flavors that include not just “shedding” load, but “shaping" load, “shifting” load and “shimmying” load to meet the needs of the grid. While the NREL report touches on energy efficiency in terms of shiftable load, the efficiency sector has not had a full seat at the table, and efficiency is not yet seen as equivalent to capacity -- or as a true resource. This is true in part because traditional forms of energy efficiency are often based on model estimates and measured over monthly averages, rather than by the hourly confidence that is required by grid planners and procurement departments. However, with advances in the use of smart meter interval data to track permanent reductions in demand over portfolios of project, it is now becoming possible to quantify energy savings -- including time and locational data -- that can finally allow this plentiful and low-cost resource to be treated as a distributed energy resource. This change represents one of the most promising opportunities to close the gap and enable us to hit these critical RPS targets. As a result, states like California and New York are finally starting to take efficiency seriously as a grid resource. In California, PG&E’s recent proposal to decommission the Diablo Nuclear plant and replace it with carbon-free and flexible resources, including procurement of 2,000 gigawatt-hours of energy efficiency by 2025 based on normalized metered performance. Similarly, New York State’s REV Energy Efficiency Procurement & Markets Working Group issued a report to define how to create a more lasting market structure to catalyze investment in energy efficiency and clean energy. Efforts like these promise new approaches to meter-measured energy efficiency that will allow it to compete as a viable, cost-effective, and reliable distributed energy resource. Closing the duck curve grid gap will require all the storage we can get our hands on, as well as a strategy that includes accelerated adoption of every other distributed load balancing energy resource we can deploy. Beyond currently available resources, new forms of load-shifting distributed energy resources will need to be brought on-line, including procurement of metered demand capacity coming from permanent changes to buildings resulting in more favorable resource curves. There is no silver bullet to hit our RPS goals while maintaining a stable grid. It's going to take handfuls of buckshot instead. Matt Golden is the CEO of Open Energy Efficiency, a company that supports the development of distributed energy procurement markets through open-source tools for measuring and valuing energy savings.